Did you guys have a great weekend? We actually got snow here in Dallas, which was kind of exciting. The weather got all crazy right before our open house on Sunday, which we were pretty worried about, but somehow we still had a really great turn out! 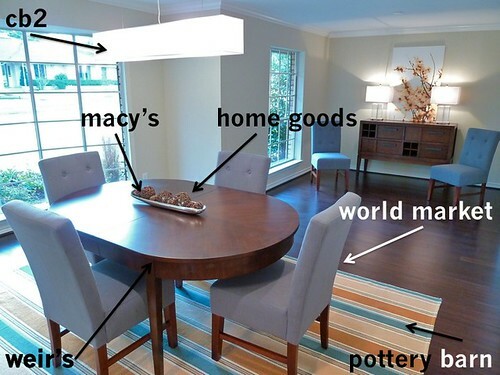 Thanks for your awesome comments about the dining room! Here are the sources we used for staging (with links where possible and while they last). I love being able to see your flip all the way through. The staging looks great. If I ever have the capital to do a flip, I would absolutely love to. If you have any problems with your next flip, you should look through the articles on http://www.charlesandhudson.com. They’ve helped direct me through a lot of my home improvement tasks. Anyway, great flip and I look forward to seeing what you do next. Lauren, thanks for the tip about Charles and Hudson – at first glance it looks great! I love the sideboard from Homegoods. Great find! Hey Liz – I had no idea Pottery Barn rugs could be so cheap! I’m considering this one for our living room, but I wanted to ask your opinion of the durability and thickness. Is this the kind of rug that would always be flipping up on the corners or wrinkling up in the middle? Do you think having a rug pad underneath would prevent any of that? Stunning! I especially love that buffet, can’t believe it was at Homegoods! Loved the staging details. But what I REALLY want to hear about is lots of details about the Open House!!! I’m sorry, but you can no longer post your sources. Kim feels the need to pick something to buy each time. This time, it’s the rug. I love that PB rug! My question is: what do you plan to do with all of the flip furniture once you sell the house? Sorry if you have answered this one before. You guys have done a great job on this house. It is beautiful. I hope you get a contract soon. Ooh! I love the two lamps perfect finds!! 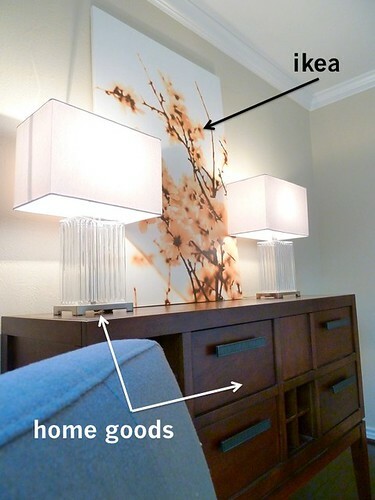 The canvas print from Ikea looks great!